You know--the ones that go on when I close my eyes. Well, they have not been so great, and their meanings are not so hidden. I had one where Cookie emailed me and asked why it had been so long since I had blogged. Of course, that was a reminder that I had missed Cookie's birthday. Then there was the one where people were yelling at me while I played ukulele. This is because I am musically horrible. The most disturbing was the dream where everyone was after my ginger root. They only came around when my ginger root had regenerated enough for a piece to be cut off, and it was all very stressful. I have that dream figured out, too. Anyway, I have not been knitting, and I think I have worked why that is the case, but issues remain. However, I have been at the sewing machine some. Mostly that means I hemmed my nephew's pants, but I did make a pincushion, too. I made mistakes with it, but it is not completely terrible. Soon, I hope to sew an apron, and it will have cupcakes on it. 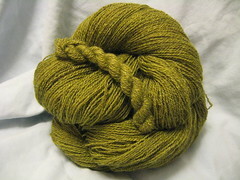 Speaking of cupcakes, I have been spinning my Leafy BFL/silk Cupcake Fiber Co (Happy 1st Birthday!) batts. The spinning experience was wonderful and even more comforting during this time of not knitting. I did pretty well, and am pleased with my efforts and results. I spun, plied, washed, and now have my big, squooshy skein of two-ply, laceweight yarn, (yardage undetermined) as well as my tiny, squooshy, mill-end skein of eleven yards. I finished it just before my new box of Cupcake batts arrived. I almost got the Mother of Pearl, but decided to get Royal because I have wanted it for so long. Speaking of long, I have yammered on long enough, so, Happy Wednesday! Perhaps I could be jumping for joy that it is January, but that might indicate that December was not good, and it really did have some wonderful times. There were some difficulties as well, and they greatly affected everything else. When last we parted, I could not sleep, and it was not the kind where I can get things done when I should be sleeping, but rather the bleary-eyed, sitting-like-a-useless-lump, type. Yeah, I often have trouble with that, but this was worse, and after about two weeks of not getting more than about two consecutive hours of sleep, my back could not cope and it brought on that vicious cycle of pain and sleeplessness. Eventually it changed, and I am so very grateful for that. While it is true that this explains much of where my December went, there was more. We had anxious times when it seemed as though the ukuleles for the nieces and nephews would not arrive in time, and then cheers of joy when they did. More about ukes in a bit. There was not nearly as much knitting (see above) but I did manage to finish two birthday gifts in time. By the way, the other moose hat was not lost, but a re-sizing attempt went horribly wrong, and that is why the replacement hat was necessary. I even made it to the post office on time, and for that I deserve extra brownie points. I suppose I lose points because the Bella Mittens were still damp, but it takes for-evah for bulky, cabled knits to dry. One knit that I thought would be for Mom ended up being mine. I was going to knit as many Calorimetry as possible for her, but I only made one, it is big, and I love wearing it. My unlabeled Unclaimed Baggage yarn was not Plymouth Boku, but rather, Noro Silk Garden. There were even twigs and a knot to prove it. I used every last bit of the yarn, and could not be more pleased. It works on even my biggest hair days. The process of getting ukuleles for the nieces and nephews revealed something to me. Last year, I bought one for Bruce for his birthday. What I discovered last month is that he did not really want one. Well, he wanted me to get one for him, but he wanted me to play it. I found that out while I was looking for a simple Christmas song to teach the kids when they got their ukes. Then, I learned how to play "You Shook Me All Night Long" by AC/DC, so there you go. That is not the only thing we learned last month. We learned that my nephew, Roshawn, needs glasses, and that he will be a big brother to a little brother in April. On Thanksgiving, we also learned that my niece, Katie, will be a big sister in July, so we will have to wait a bit to find out the brand on that baby. With all that we have learned lately, I wonder what all we will learn in 2012. I suppose I am a little bit excited and a little bit scared, but that's life, isn't it?